Summary: According to researchers, when learning a new task, the brain is less flexible than previously believed. Visualization of population activity patterns from an example experiment. 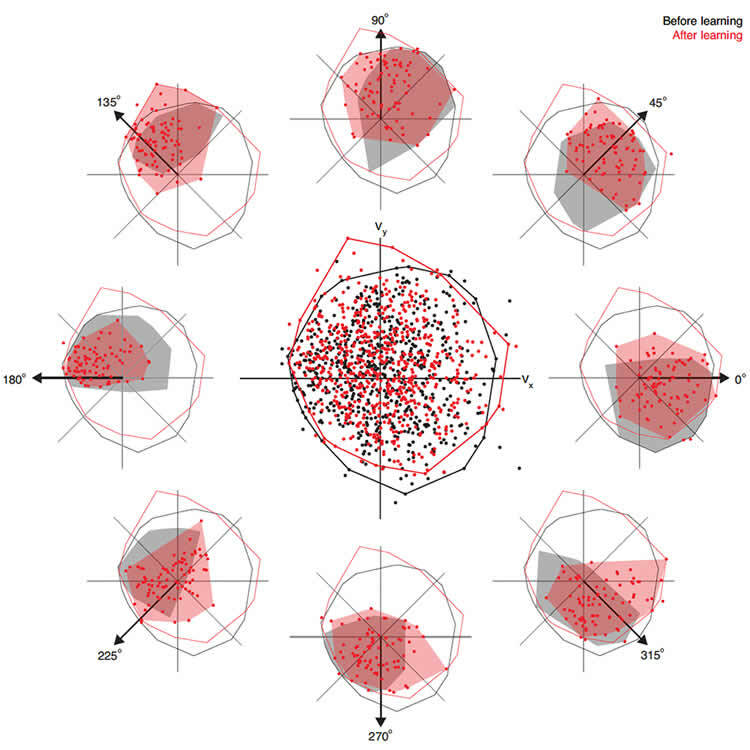 Population activity patterns recorded before learning (black; from the last 50 trials under the intuitive BCI mapping) and after learning (red; from the 50 trials of peak performance under the perturbed BCI mapping), visualized as their 2-D output through the perturbed BCI mapping. Each point represents the cursor velocity that an activity pattern contributes to cursor movement according to the perturbed mapping. NeuroscienceNews.com image is credited to the researchers/Nature Neuroscience. Image Source: NeuroscienceNews.com image is credited to the researchers/Nature Neuroscience. Carnegie Mellon University “The Learning Brain is Less Flexible Than We Thought.” NeuroscienceNews. NeuroscienceNews, 13 March 2018. Carnegie Mellon University “The Learning Brain is Less Flexible Than We Thought.” http://neurosciencenews.com/learning-brain-flexible-8623/ (accessed March 13, 2018). Behavior is driven by coordinated activity across a population of neurons. Learning requires the brain to change the neural population activity produced to achieve a given behavioral goal. How does population activity reorganize during learning? We studied intracortical population activity in the primary motor cortex of rhesus macaques during short-term learning in a brain–computer interface (BCI) task. In a BCI, the mapping between neural activity and behavior is exactly known, enabling us to rigorously define hypotheses about neural reorganization during learning. We found that changes in population activity followed a suboptimal neural strategy of reassociation: animals relied on a fixed repertoire of activity patterns and associated those patterns with different movements after learning. These results indicate that the activity patterns that a neural population can generate are even more constrained than previously thought and might explain why it is often difficult to quickly learn to a high level of proficiency. What you have to consider is the work of the mind reorganising and checking stored data and beliefs. The neurons take care of themselves! They’ve had millions of years of practice. New knowledge needs time for implementation.